If are you are thinking of getting an automatic cat door but you want to know how they work, in this article we provide all the information you need. Let’s start saying that an automatic cat door is a small gate in a door, wall or window with a selective locking mechanism that allows the cat to enter the house and stop any other animal from trying to access the home. Automatic or electronic cat doors require the cat to wear a key to activate the system to unlock the door, allowing the cat to push the door with its head or nose and enter the house. The pet door needs to be programmed by registering the cat’s tag or microchip in its memory. Depending on the technology this key could be an ID code, a color code if IR or ultrasonic signal. Unlike automatic cat doors, the traditional pet door simply consists in a moving “flap” that has to be pushed by the cat to get in without any locking mechanism. The concept is that any animal bigger than a cat won’t be able to access the house. However, other small animals, such as raccoons, other cats, etc. can get into the house. Today, most cat doors are electronically operated with different locking mechanisms and technologies. Automatic: It’s the “flap” type that works with hinges and it swings to open. Once the mechanism registers the cat key and unlocks, the pet needs to push this door with its head or nose to get inside the house. Fully Automatic: It’s the motorized cat door that looks similar to a human door in its shape. 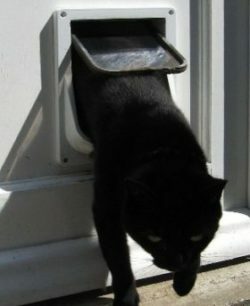 This type of cat door opens by sliding up vertically, powered by a motor. 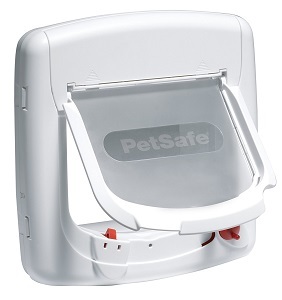 The pet does not need to do anything other than stand up facing the door and activate the mechanism with a collar for the door to slide upward open. One of the best benefits of automatic cat doors is that cats can get in and out as they please without the need of somebody opening the door each time. This benefit becomes crucial when cat owners are not home during the day. Also, pet doors allow cats to get back in the house if bad weather condition occurs while they are out so they can get refuge at home from rain and cold. To protect the house from bad weather or during a trip, cat doors can be locked with a sliding mechanism parallel to the pet door. Motorized fully automatic cat doors can be locked with a deadbolt lock. Some cat doors can only be locked or unlocked (2-way locking), while others offer more options (4-way locking). Unlocked (in & out), pets can get in and out as much as they want using the collar tag. Locked (in & out), pets can’t get through the door. Unlocked (in & out), pets are free to get in and out using the collar tag. Locked (in & out), pets cannot get through the door. Only-In, cats can’t exit the door but they can get in. This system is useful if you want your cat to stay inside the house. It is also a good feature in case your pet escapes through a window or if someone let the cat out unintentionally. Only-Out. This mechanism allows pet only to exit the house but they can’t get back in. This feature is good if you want your pet to be outside for any reason. Automatic cat doors use different technologies for the cat’s collar to transmit a signal to the control panel to unlock it, such as infrared, electromagnetic, magnetic, ultrasonic signal and radio frequency. According to the mechanism used automatic pet doors can be classified as Electronic, Motorized, and Magnetic. They use a tag or “key” in the cat’s collar or microchip implant which activates a latch to open the flap for the pet to push and enter. 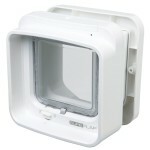 All electronic cat doors need the cat intervention to get through by pushing the door with the nose or head. Control panels are all powered by batteries, AC adapter or both. Infrared signal. The cat uses a collar tag that needs to be powered. Magnetic field “electromagnetic”. The cat needs to use a collar with a magnet. High pitched sound (ultrasonic). The cat uses a collar that needs to be powered. RFID (radio frequency Identification): Either collar tag or microchip implant. A microchip implant is the most modern concept of “key” to unlock the door. 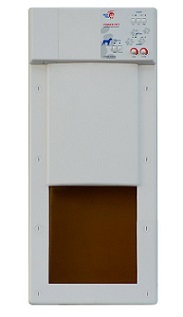 The microchip cat door gets activated by a microchip inserted into the pet’s skin with a unique ID code which is read and recognized by the control panel. Some RFID (radio frequency Identification) electronic cat doors have a timer, allowing to set an “outdoor schedule” for the cat. The following video shows an electronic cat door that works with RFID technology to unlock the latch. 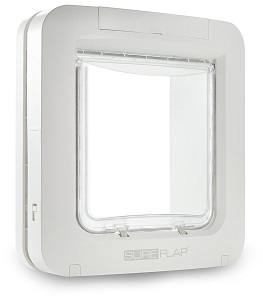 This is the SureFlap Microchip cat door in action. In this video you will see that the mechanism is 4-lock which means, it can be locked from outside and allows only the cat to enter the door. The cat has been micro-chipped (implant) and that’s why you won’t see a collar tag. Electronic cat doors are more effective than other systems to stop unwanted animals from following the allowed cat. The system allows you to block the access of any animal but your cat. Good electronic cat doors with a 4-lock system are really effective. The deterrent mechanism in case the electronic pet door doesn’t feature a 4-lock system, is a hard-swinging flap towards the intruder when the cat is entering the door, acting as a deterrent. Cats need to push the door to enter and if they take too long the mechanism could close before the door swings shut. Basically, the mechanism locks the flap in the open position. Another disadvantage is the possibility of the cat getting trapped in the door. If this happens most likely the pet won’t use the door again. Unwanted cats or raccoons could pull the flap open with their claws since some electronic pet doors do not prevent “flaps” from swinging outward. The cat does not need to push the door to enter the house; a collar tag is sensed and a motor opens a vertical sliding door for the cat to get in. The range of distance to activate the motor can be adjusted. Once the cat is inside, the door slides down, shutting and locking automatically. The technology used as a “key” can be ultrasonic, magnetic or RFID. The cat door’s control panel needs to be powered. Cats don’t need to push the door which is good, especially when cats use the paws to push the door instead of their nose or head, having problems when they want to get in because the door got locked before they tried. Motorized pet doors are good for timid, disable or very old cats. Also, they are good for multi-pet households with dogs and cats. They have a safety mechanism that keep your pet safe in case of blockage. While the door is opening, a second pet can follow very close the first one and enter the door. While the time for the door to shut can be shortened by a setting, the door still does not offer a swinging hard flap in front of the unwanted pet to act as a deterrent. In the following video you will see a lazy dog that just wants to chill right under the motorized pet door (lol). You will see how the mechanism works, the pet doesn’t need to push the door, it opens automatically. Also, you can see the safety mechanism that makes the door to retract when sensing an blockage. They use magnets to pull a lever to unlock the door when in contact with the magnet in the cat’s collar. This system does not need to be powered either in the collar’s tag or control panel, which makes it very handy in areas where electricity is not available. Collar attracts metallic objects such as nails, and any other small metal objects, etc, to the collar. Other unwanted pets with a magnet can access to the house. In the following video you will see a demonstration of someone with a magnet in her hand and how the latch opens in contact with it. What’s the best type of door for a single cat? It depends on various factors but in terms of reliability and safety, the electric microchip pet door (activating by a microchip implant) is the best option to be used for one cat. These cat doors have the best access control because when a microchip is programmed in the door’s memory, no animal with any other tag can get in the house. Other systems are good options too, but they all need the cat to wear a collar which may not be safe if your little guy likes to get into narrow areas or trees. What’s the best type of flap for a multiple- cat household? There is not a “best solution” because every household is different. However, motorized cat doors or electric cat flaps using electromagnetic or RFID tags are a good solution for multi-cat households. 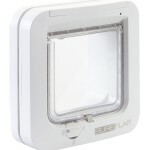 When looking for a pet door with selective control access from outside and inside, it is a better choice the electronic cat flap with RFID tag because with motorized cat doors you cannot control selectively what pet exits or enters the house. Do cats easily adopt pet doors? Most cats adopt electronic doors easily and they learn how to use them with proper training. Timid, disable or very old cats might get intimidated by electronic pet doors. If this is the case, you have the option of motorized pet doors that allow the cat to get in without the need of pushing the door. Whatever you choose for your cat, you’ll give your feline friend freedom to enjoy the outdoors. 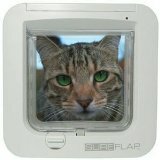 Is a cat door different from a small size dog flap? Yes, they are different. Small size dog doors have a little more rectangular shape, they have metal frames and the flaps tend to be more flexible but there are also hard flaps. On the other hand, cat doors have a square shape, the material of the flap is usually hard and acts as a deterrent when bouncing against possible unwanted animals. The frame of cat doors usually is made from plastic. Of course, this is not the rule; there are a lot of different types of pet doors on the market. As you can see, they are several types of automatic cat doors and how they work will help you to decide what you need, according to your lifestyle and your pet’s personality.